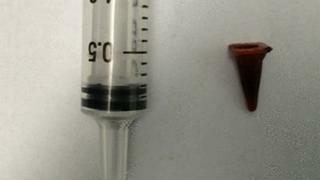 Doctors removed a toy traffic cone from a patient's lung - 40 years after he inhaled it by accident. The 47-year-old man, from Preston, was referred to a respiratory clinic after having a cough for over a year. Medics suspected the patient - a long-term smoker - had a tumour when scans showed something on his lung. However, when they removed the mass they discovered it was the "long lost Playmobil traffic cone" he had received on his seventh birthday. A report in the British Medical Journal (BMJ) said the postman told doctors he "regularly played with and even swallowed" the toy pieces during his childhood. But, on one occasion, he believes he inhaled a tiny plastic traffic cone. Because the man was so young when he inhaled the toy, the report said, his airway may have been able to remodel and adapt to the presence of a foreign body. It was not unusual for children to ingest or inhale small toys, it said, but "a case in which the onset of symptoms occurs so long after initial aspiration is unheard of". Four months after the removal of the tiny traffic cone, the patient's cough had almost gone and his symptoms had improved markedly, the report said.